John Winston Lennon was an English songwriter and musician who had become a worldwide inspirational artist as one of the founding members of the famously well-known band The Beatles. Lennon was born and raised in Liverpool, England. Growing up, his musical talent had been discovered by a bus driver when playing a mouth organ on his way to visit his cousin in Scotland. As a teenager, Lennon became involved in his first band Skiffle Craze. Shortly afterwards, he had decided he wanted to make a new band called The Quarrymen which shortly after evolved into The Beatles in 1960. In March 1969 after getting married to his wife Ono, they spent their honeymoon in bed at the Amsterdam Hilton Hotel as what they named “Bed-In for Peace” which attracted the worldwide media. A few years after in 1971 Lennon had moved to New York where his criticism of the Vietnam War and songs War Is Over and Give Peace a Chance were used as anthems by the “Anti-War Movement.” Later on that year, Lennon and Ono supported the family of James Hanratty, after he was hanged for murder in 1962 to prove his innocence. The couple had staged a “Silent Protest for James Hanratty” along with a “Britain Murdered Hanratty” banner march and a fourty minute documentary on the case. Years later at a hearing, Hanratty’s conviction was upheld. John Lennon and his wife had also showed their fellowship and support towards the Clydeside UCS workers’ work-in in 1971 by sending a checque for £5,000 and a bundle of red roses. On December the 8th, 1980 was when John Lennon was shot five times in the back on his way home to his hotel with Ono. The murderer was an obsessed fan, Mark David Chapman, who thought he would get Lennon’s fame if he murdered him. An hour after the incident, Lennon was declared dead. 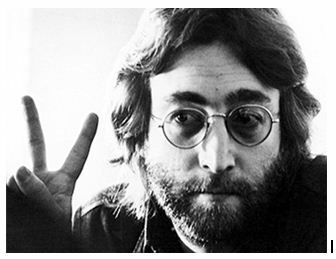 John Lennon to this day has remained an inspiration, both for his life after the Beatles career as a peace. This entry was posted in The Good and tagged Beatle, John Lennon, Vietnam War by bvanderkley. Bookmark the permalink. It strikes me when people hear terrible things about famous people, they say; it shows he/she is human. While if normal people do terrible things, they are seen as terrible. John Lennon beat up both of his wives and many other people and neglected/emotionally abused his son. There is no excuse for that….